Where will you be at 8 AM this Saturday? If you said a viewing party for the ‘Round-The-Island Race, that’s the right answer! The event will kick-off on Thursday the 23rd with the Third Annual ‘Round-the-Buoys Race and continue throughout the weekend. The race will consist of IRC, HRP, PHRF, One-Design, Double-Handed, Classic and Cruising Divisions. 67 boats from throughout the East Coast have already registered to compete in one of the most exciting staples of the racing season. ‘Round-The-Island Race is fast approaching, so ready your friends and family and book your slip or mooring, because this year is sure to be a wild ride! Edgartown Yacht Club has been host to this very race since the summer of 1938. ‘Round-The-Island Race has since been a showcase of the skill, excellence and resilience of the skippers and their teams. The only years in which the race did not take place was during the course of the Second World War, when Martha’s Vineyard was transformed into a military base. The race is similar to the historic race around the Isle of Wight in England, however this event has all of the charm and excitement that only a New England boating event can exude. Winners of ‘Round-The-Island Race have gone down in history as the best sailors in the area. Skippers will race around the entirety of the island, through the waters of The Nantucket Sound, The Atlantic Ocean and The Vineyard Sound. 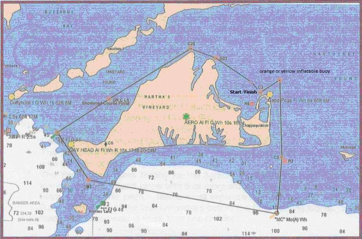 The 56 nautical mile course has views of all seven of Martha’s Vineyard’s lighthouses: Cape Poge, Gay Head, Tarpaulin Cove, Nobska, West Chop, East Chop and Edgartown. At one time the race included an extended route around Buzzards Bay Tower, however today the course is strictly around the island! A Team Award: the best corrected time of a 3-boat team from a given yacht club (or Service Academies) with entries in more than one division. 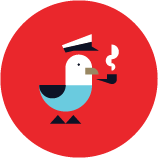 This 'Round-The-Island Race weekend, consult Dockwa, the transient docking app, to eliminate the stress and frustration of booking slips and moorings!